Human monocyte differentiation Ag CD14 is a pattern recognition receptor that enhances innate immune responses to infection by sensitizing host cells to bacterial LPS (endotoxin), lipoproteins, lipoteichoic acid, and other acylated microbial products. CD14 physically delivers these lipidated microbial products to various TLR signaling complexes that subsequently induce intracellular proinflammatory signaling cascades upon ligand binding. The ensuing cellular responses are usually protective to the host but can also result in host fatality through sepsis. In this work, we have determined the x-ray crystal structure of human CD14. The structure reveals a bent solenoid typical of leucine-rich repeat proteins with an amino-terminal pocket that presumably binds acylated ligands including LPS. Comparison of human and mouse CD14 structures shows great similarity in overall protein fold. However, compared with mouse CD14, human CD14 contains an expanded pocket and alternative rim residues that are likely to be important for LPS binding and cell activation. 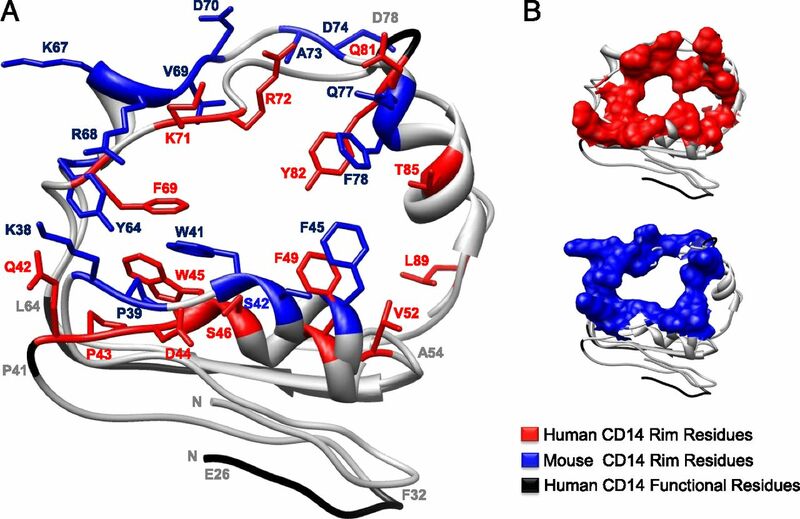 The x-ray crystal structure of human CD14 presented in this article may foster additional ligand-bound structural studies, virtual docking studies, and drug design efforts to mitigate LPS-induced sepsis and other inflammatory diseases. CD14 was first characterized as a membrane cell-surface differentiation marker of myeloid lineage cells (1). Membrane CD14 is a GPI-anchored 55-kDa glycoprotein (2, 3) that is highly expressed on monocytes, macrophages, and neutrophils with lower surface expression observed on a variety of other hematopoietic and stromal cells. Soluble forms of CD14 exist in serum, cerebrospinal, and other body fluids. Soluble CD14 is generated by at least three different mechanisms that include bypassing of GPI addition, cleavage of the GPI anchor by phospholipase D, or direct proteolytic cleavage from the cell surface (reviewed in Ref. 4). CD14 is best known as a pattern recognition receptor of the innate immune system that plays a prominent role in sensitizing cells to the presence of Gram-negative bacterial LPS (endotoxin) (4). CD14 is thought to sensitize cells to LPS by delivering this agonist to the TLR4 receptor signaling complex. Membrane CD14 shuttles LPS to TLR4 complexes in a two-dimensional search (4), whereas soluble CD14 enables cells that lack endogenous CD14, including most epithelial and endothelial cells, to respond to LPS (reviewed in Ref. 5). LPS-induced TLR4 activation initiates host inflammation by driving cellular production of proinflammatory cytokines, chemokines, and cell adhesion molecules. At the local site of infection, proinflammatory signaling resulting from CD14 activity is protective, leading to local clearance of invading bacteria. However, widespread infection and activation of this proinflammatory signaling system can cause fatality through sepsis (reviewed in Refs. 6, 7). In response to LPS, CD14-deficient mice have blunted proinflammatory cytokine production and lack the lethargy, respiratory, and ruffled fur symptoms associated with murine septic shock. CD14-deficient mice also survive challenge with otherwise lethal doses of LPS (8). LPS is the major lipid present in the outer membrane of Gram-negative bacteria (9). LPS is an amphipathic molecule and in enteric bacteria is composed of a hexaacylated lipid A region with a diglucosamine backbone flanked by 1 and 4′ phosphates. The length, number, and saturation of the fatty acid tails in LPS can vary between different species of bacteria (10), as can the length and sugar content of the core and O-Ag regions (11). The binding of LPS by CD14 is slow unless this binding reaction is catalyzed by LPS-binding protein (LBP) (12, 13). LBP is a 60-kDa human serum glycoprotein produced by liver hepatocytes (14, 15) that disaggregates and catalytically transfers LPS to CD14 (16). In concert with LBP, CD14 binds monomeric LPS (12) and shuttles it to the TLR4 complex. This effectively concentrates low levels of LPS and increases the sensitivity of the system (4, 12, 13, 17, 18). The major LPS acceptor of the TLR4 receptor complex is a 25-kDa coreceptor called MD-2, which is physically associated with TLR4. The binding of LPS to the TLR4–MD-2 complex facilitates dimerization, resulting in a homodimeric receptor signaling complex composed of two TLR4 monomers, two MD-2 proteins, and two LPS molecules (19). Cell signaling is facilitated by the intracellular signaling domain of TLR4, which upon dimerization creates a platform for intracellular signaling adaptors (20). Small gel filtration mixing studies have demonstrated a catalytic role for CD14 in the delivery of LPS to the TLR4–MD-2 complex (17, 21–24). As a pattern recognition receptor, CD14 is capable of binding a wide variety of natural and synthetic acylated ligands in addition to LPS. For example, CD14 and LBP can work together to opsonize whole bacteria and apoptotic cells, clearing infection and reducing inflammation (25–29). CD14 is also able to bind and shuttle certain host phospholipids (30–32). Further, CD14 has been shown to enhance cellular inflammatory responses to a variety of acylated bacterial agonists of TLR2, including lipoteichoic acid, mycobacterial lipoarabinomannan, atypical LPSs, and lipoproteins (33–40). Given this central role in TLR agonist delivery, CD14 is an obvious drug target for the treatment of sepsis (reviewed in Refs. 6, 7). The molecular interactions involved in the binding and delivery of structurally diverse ligands presumably requires multiple protein–ligand and protein–protein interaction sites on CD14 that are currently undefined. In addition, the mechanisms involved in delivery of these ligands to multiple TLR complexes are also unresolved. To address this gap in knowledge, many groups have purified various recombinant forms of soluble CD14 using bacteria, yeast, insect, and human cellular expression systems (12, 41–51), often with the goal of structure determination (49, 50). Currently, only the unliganded crystal structure of mouse CD14, purified from SF9 insect cells, is known (52). Mouse CD14 possesses an N-terminal hydrophobic cavity that provides a putative binding site for LPS and other acylated ligands. Despite previous efforts, no structure of human CD14 has been determined, and the structural similarity between mouse and human CD14 is unresolved. In this article, we report the crystal structure of human CD14. Because septic shock is the most common cause of death in intensive care units (53), information garnered from the structure of human CD14 may foster ligand-binding structural studies or drug development efforts. Human CD14 (aa 1–336) was amplified from genomic DNA by PCR using a sense primer, 5′-TTGGAATTCGCCGCCACCATGGAGCGCGCGTCCTGCTTGTTGC-3′, containing an EcoRI site, Kozak sequence, and a portion of the N-terminal secretion signal of human CD14, and an antisense primer, 5′-TTGTCTAGAACTACCGCGGGGGACGAGGGCAGTTCCAG GGACCAGGAAGG-3′ containing a XbaI cleavage site followed by a thrombin digestion site. The PCR products were digested and cloned into a modified pDisplay vector via EcoRI and NheI sites (a kind gift from Dr. David Kranz, University of Illinois, Urbana-Champaign, IL). This vector contains the coding sequence of the Fc domain of human IgG1 downstream of an NheI restriction, enabling generation of an Fc fusion protein. The antisense PCR primer was designed to include a thrombin cleavage site (LVPRGS) allowing for removal of the Fc fusion during purification. Site-directed mutagenesis was completed through primer extension to yield the C306S mutation. The final construct sequence was confirmed by automated sequencing (University of Illinois at Urbana-Champaign Sequencing Center). After DNA amplification in Escherichia coli DH5α cells, HEK 293F cells (Invitrogen) were transfected, cultured, and stably selected as previously described (54). Human soluble CD14 (aa 1–336, C306S) was purified in four chromatographic steps. First, protein G affinity purification was used to harvest the human CD14 Fc fusion (CD14-Fc) from HEK 293F culture supernatant as previously described with the following exceptions (54): 2 liters HEK 293F supernatant from stably transfected CD14-Fc–expressing cells was harvested 7 d after seeding to 0.3 × 106 cells/ml in serum-free Freestyle 293F media (Invitrogen Life Technologies) under G418 (0.25 mg/ml) selection. Recombinant protein G Sepharose beads (GE Healthcare; 2 ml 50% slurry) were added to the filtered supernatant with stirring overnight at 4°C. Protein G beads bound to CD14-Fc were harvested by centrifugation at 2500 × g, 15 min, 4°C, and packed into a disposable PD-10 column (GE Healthcare). The column was washed with 0.02 M sodium phosphate, pH 7.0, and eluted in 10-column volumes of 0.1 M glycine-Cl, pH 2.3 with 1 ml neutralizing 1 M Tris-HCl, pH 9 buffer. Thrombin (Novagen) was used to remove the Fc tag by overnight incubation at 22°C. Next, the products of the thrombin cleavage reaction were separated by passing the sample through an ÄKTAprime plus fast protein liquid chromatography fitted with two tandem 1-ml Hi-Trap Protein A high-performance columns (GE Healthcare). The columns were run at a 1-ml/min flow rate in 0.02 M Tris HCl, pH 8.5. The flow-through fractions containing free human CD14 were collected and injected on the two tandem Protein A columns three consecutive times to remove Fc. Flow-through fractions containing soluble CD14 were pooled and concentrated to 1 ml using an Amicon Ultra-15 U (Millipore). Because glycosylation contributes to protein heterogeneity, we removed N-linked glycans from CD14 by a 1-h incubation at 37°C in 1xG7 buffer (0.05 M sodium phosphate, pH 7.5) containing 1000 U peptide N-glycosidase F (PNGaseF) (New England Biolabs). This deglycosylated CD14 was further purified by anion exchange chromatography using two tandem 5-ml Hi-Trap Q anion exchange columns (GE Healthcare) and a linear NaCl gradient (0.02–1 M) in 0.02 M Tris-HCl, pH 8.5 at 4°C using a 1 ml/min flow rate. CD14-containing fractions were concentrated using an Amicon Ultra-15 U (Millipore) to 0.5 ml. Finally, size-exclusion chromatography was performed using a Superdex 200 column (GE Healthcare) equilibrated with 0.02 M Tris-HCl, pH 8.5, and 0.1 M NaCl at a flow rate of 0.4 ml/min. The fractions containing CD14 were pooled and concentrated to 10 mg/ml using an Amicon Ultra-4 U (Millipore) as measured by Pierce BCA assay (Pierce, Rockford, IL). Buffer conditions were determined using a solubility screen (55). This four-column purification process yielded ∼2 mg/l soluble, human CD14 with >90% purity by SDS-PAGE gel (Supplemental Fig. 1A, 1B). Human CD14 (aa 1–336; C306S) was crystallized using the hanging-drop vapor-diffusion method. Crystallization conditions were initially screened using commercially available sparse matrix kit conditions, including Hampton Research Crystal Screens I and II, Emerald Biosystems Wizard I and II, Hampton Research Natrix, and Hampton Research Salt Reaction, as well as a handmade crystal screen targeting the previously published mouse CD14 crystallization condition (1 μl protein solution and 1 μl crystallization buffer containing 100 mM sodium HEPES [pH 7.5], 1.9 M Li2SO4, and 5 mM NiCl2) (52). Each condition was tested on a 12 × 0.22 mm siliconized glass cover slide (Hampton Research) over a VDX48 plate with sealant (Hampton Research) by mixing 1 μl of each screening solution with 1 μl protein solution (10 mg/ml protein in 0.02 M Tris-HCl, pH 8.5, and 0.1 M NaCl) equilibrated against 300 μl screening solution in the reservoir. Sparse matrix screening in hanging drop vaporization trays at 22°C, 18°C, and 4°C lead to three conditions with single crystals: Emerald Biosystems Wizard I #28 (20% polyethylene glycol [PEG] 3000, 0.1 M HEPES, pH 7.5, and 0.2 M NaCl) after 2–4 d at 22°C; Hampton Research Crystal Screen I #18 (20% PEG 8000, 0.1 M Na cacodylate, pH 6.5, and 0.2 M Mg[OAc]) after 6 d at 18°C; and Emerald Biosystems Wizard II #28 (20% PEG 8000, 0.1 M MES, pH 6.0, and 0.2 M Ca[OAc]2) after 3 wk at 22°C (56–58). The best initial diffraction resolution (6.2 Å) was obtained using Emerald Biosystems Wizard II #28. Extensive work was conducted to improve diffraction resolution. During crystal optimization, various additives, detergents, proteases, and cryoprotectants were screened, using multiple crystal harvesting time points (59–61). Further postcrystallization optimization work included in situ proteolysis, dehydration via serial transfer on cover slips or over the reservoir for different durations, macromolecular crystal annealing, flash annealing, and reductive methylation of surface lysine residues using dimethylamine-borane complex (62, 63). Treatment with each of these additional techniques failed to improve the diffraction resolution (data not shown). Single crystals of purified deglycosylated CD14 were grown at 22°C to a maximum dimension over ∼40 d on a 22 × 0.22 mm siliconized glass cover slide (Hampton Research) over a VDX24 plate with sealant (Hampton Research) by mixing 1.5 μl 30% PEG 6000, 0.1 M MES, pH 6.0, and 0.2 M Ca(OAc)2 crystallization solution with 1.5 μl protein solution (10 mg/ml protein in 0.02 M Tris-HCl, pH 8.5, and 0.1 M NaCl) equilibrated against 1 ml screening solution in the reservoir. Crystals were harvested from the drop and plunged directly into liquid N2 without additional cryoprotection. A native diffraction data set was collected at 4.0-Å resolution from a single vitrified crystal in the optimized 30% PEG 6000, 0.1 M MES, pH 6.0, and 0.2 M Ca(OAc)2 crystallization solution on the LS-CAT beamline, Sector 21 ID-F (Advanced Photon Source, Argonne, IL). Diffraction data were indexed and integrated using XDS followed by scaling and merging with XSCALE. The structure solution was determined via molecular replacement with Phaser in the CCP4 suite, using the molecular coordinates of mouse CD14 (Protein Data Bank ID 1WWL), modified with CHAINSAW. Iterative cycles of model fitting were completed in COOT, followed by refinement in REFMAC. The final structure of human CD14 was deposited under the accession number 4GLP (http://www.rcsb.org/pdb/search/structidSearch.do?structureId=4GLP), and verified with Molprobity in PHENIX. Data collection and refinement statistics are summarized in Table I. The binding of LPS by PNGaseF deglycosylated human CD14 (34 kDa) was detected by a native PAGE gel shift method (64). Ten micrograms human CD14 was mixed with a 2:1 molar ratio of the Ra chemotype of E. coli LPS (3.79 kDa; Sigma-Aldrich), with or without a 1:100 molar ratio of LBP:CD14 (LBP kindly provided by Dr. Jerrold Weiss, University of Iowa). The reactions were incubated for 1 h at 37°C in a total volume of 5 μl in PBS buffer containing 0.01 M EDTA. Five microliters bromophenol blue with glycine dye was added, and each sample was loaded in a 4–20% Mini-PROTEAN TGX precast gel, pH 6.8 (Bio-Rad), run at 100 V in the recommended running buffer without SDS at 4°C for 3 h (Supplemental Fig. 2). Various concentrations of the Ra chemotype of E. coli LPS (Sigma) were preincubated for 1 h at 37°C at a 2:1 molar ratio LPS:CD14 in RPMI media containing 1% human serum albumin. For some reactions, LBP was added as a catalyst at a 1:100 molar ratio of LBP:CD14. The bioactivity of CD14 in these reactions was assessed using SW620 human epithelial cells that express TLR4/MD-2 and lack detectable levels of membrane CD14 (42). SW620 cells were cultured in RPMI complete media containing 1% BSA, seeded in a 96-well plate at a density of 1 × 106 cells/well, and allowed to adhere for 1 h at 37°C, 5% CO2. To remove serum, we carefully washed SW620 cells four times with PBS, two times with Life Technologies FreeStyle 293 Expression Media (Invitrogen), and two times with RPMI containing 1% human serum albumin. Preincubated LPS samples were added to the washed SW620 epithelial cells. Supernatant was harvested 6 h later, and IL-8 production was measured using a human IL-8 Cytoset sandwich ELISA kit (Invitrogen) (Supplemental Fig. 3). A number of important parameters were considered in generating a soluble form of human CD14 suitable for crystallization. Because soluble forms of CD14 are naturally heterogeneous at the C terminus, we generated an expression construct that lacks the C-terminal protein sequence required for GPI anchoring. This was done with the knowledge that C-terminal truncation of CD14 does not affect LPS-associated bioactivity, which resides entirely within the N-terminal half of the protein (65, 66). In addition, because our CD14 construct is truncated between C306 and C352, which are predicted to form the final disulfide bond, we mutated the unpaired C306 residue to serine. CD14 was expressed as an Fc-tagged fusion protein and purified over protein A. An engineered thrombin cleavage site enabled removal of the Fc tag, and further purification steps resulted in highly pure soluble CD14 protein suitable for crystallization (Supplemental Fig. 1A, 1B). To further ensure improved protein homogeneity for crystallization, we removed potentially heterogeneous N-linked glycans using PNGaseF. This enzymatic deglycosylation was preferred because mutation of the N-linked glycosylation sites in CD14 prevents cellular secretion (52). As observed by others, PNGaseF treatment reduced the molecular mass of CD14 by ∼10 kDa (67, 68) (Supplemental Fig. 1C). To ensure that our soluble human CD14 is biologically active, we measured the ability of the purified protein to bind LPS and to mediate MD-2/TLR4–dependent chemokine production. Binding was assessed by mixing a 2:1 molar excess of the Ra chemotype of E. coli LPS with CD14 in the absence and presence of a catalytic amount of LBP. CD14 formed a complex with LPS as evidenced by altered mobility on a gradient native PAGE gel relative to CD14 alone (Supplemental Fig. 2). We also assessed the ability of our purified soluble CD14 to induce LPS-mediated activation of human epithelial SW620 cells. These cells naturally express the TLR4/MD-2 signaling complex, but lack endogenous CD14 such that LPS-induced activation is greatly enhanced by addition of active forms of soluble CD14 (41, 42). To this end, purified soluble CD14 was preincubated with increasing concentrations of LPS in the presence of LBP to facilitate CD14–LPS complex formation. Preincubated LPS, LBP, and CD14 potently stimulated IL-8 production of SW620 cells and enabled detection of 100 pg/ml LPS, with maximal cell stimulation observed at 10 ng/ml LPS (Supplemental Fig. 3). These LPS-induced IL-8 production levels were comparable with that mediated by human serum that naturally contains LBP and CD14 catalytic activity. In contrast, either LPS alone or LPS preincubated with LBP poorly activated the cells. Taken together, these results show that the soluble human CD14 (aa 1–336, C306S) used in this study binds LPS and is biologically active. Human CD14 crystallized in the trigonal space group P3221 (Table I). The crystal structure begins with aa 26, indicating complete removal of the leader sequence by HEK 293F cells during secretion along with low electron density for the first six amino acids, aa 20–25. 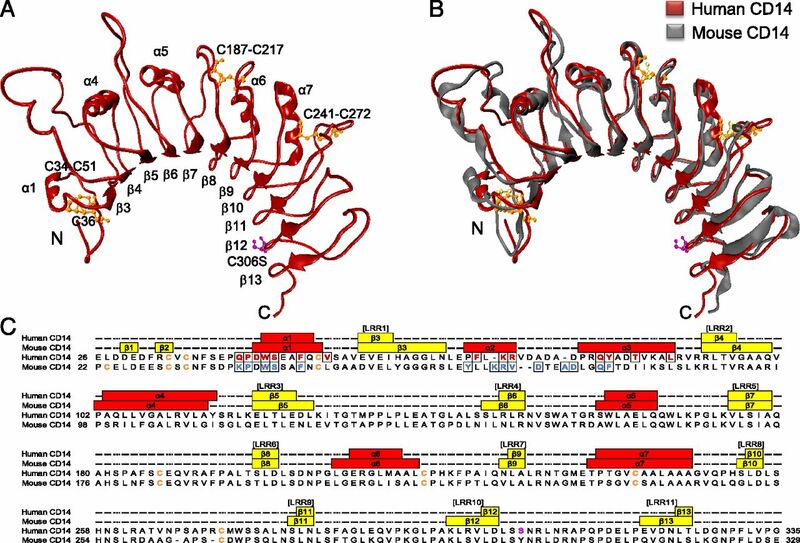 The overall x-ray crystal structure of human CD14 reveals a bent solenoid that is formed by 11 leucine-rich repeats, each creating a single turn (Fig. 1A). This is consistent with the leucine-rich repeat sequence motifs of human CD14 (69), and the expected bent solenoid fold generally characteristic of leucine-rich repeat–containing proteins (70). The structure also reveals five α helices on the convex side, as well as 11 β-strands that are coordinated in a parallel β sheet on the concave side of the bent solenoid. The pairwise proximity between cysteine residues in the crystal structure at positions 34 and 51, 187 and 217, as well as 241 and 272 are consistent with the expected disulfide bonds of human CD14, which have been shown to be important for proper protein folding (49). Interestingly, recombinant purified human CD14 lacking the C306S mutation, a mutation originally designed to avoid unnatural disulfide binding, did not crystallize and formed aggregates in the crystallization drop (data not shown). Human CD14 x-ray crystal structure. (A) The x-ray crystal structure of human CD14 aa 26–335 is shown in ribbon (red). α helices (α1, α4, α5, α6, α7), β strands (β3-β13), and the positions of cysteine residues (orange) are indicated. The site-directed mutagenesis of C306S is shown in magenta. (B) Secondary structure alignment of human CD14 (red) and mouse CD14 (gray) was created using the default parameters of MultiSeq in Visual Molecular Dynamics (VMD). Disulfide bonds in human CD14 (orange) and mouse CD14 (yellow) are indicated. The site-directed mutagenesis of C306S is shown in human CD14 (magenta). (C) A structure-based sequence alignment of human and mouse CD14 was created using the default parameters of MultiSeq in VMD. MultiSeq output was used to assign human CD14 secondary structure elements upon visualization in VMD, and mouse CD14 secondary structure positions were derived from the header notation of 1WWL.pdb. Numbered leucine-rich repeat regions (LRRs), which are conserved in location between both species, are shown in brackets. α helices (red rectangles), β strands (yellow rectangles), and turns and loops (black dashed lines) are indicated. Cysteine residues (orange) and residues located in the rim of the N-terminal pocket are boxed for human CD14 (maroon) and mouse CD14 (blue). Because amino acid numbering is not standardized in previous publications, we have chosen to compare mouse and human CD14 crystal structures by starting amino acid numbering at the first methionine residue. Another key structural feature present in the crystal structure of human CD14 is an N-terminal pocket or cavity (Fig. 2A). Although we cannot know with certainty the position of each side chain at this resolution, the overall cavity of human CD14 is composed largely of hydrophobic residues present in α1 through α5 and β1 through β6, along with their connecting loops. It is reasonable to assume that this hydrophobic pocket serves as the binding site for the lipid chains of LPS and other acylated CD14 ligands (Fig. 2B), especially as the regions making up the pocket are entirely contained within the N-terminal region (aa 20–171) of CD14 that has been shown to be sufficient for bioactivity (65, 66). Comparison of mouse and human CD14 N-terminal ligand-binding pocket. (A) Mouse (gray) and human (red) CD14 ribbon structures are overlaid over mouse (translucent gray) and human (translucent red) CD14 space-filling structures drawn in Visual Molecular Dynamics. CD14 structures are rotated 90° relative to Fig. 1B. The N-terminal hydrophobic binding pocket is indicated (black arrow). (B) Space-filling hydrophobicity structures were drawn in Chimera for human CD14 (left) and mouse CD14 (right). The Kyte–Doolittle scale was used to compare hydrophobicity by showing hydrophobic (orange), neutral (white), and hydrophilic (blue) residues, as well as glycosylation sites (red). It is instructive to examine the rim residues of the CD14 hydrophobic pocket because these residues likely engage portions of LPS, or other acylated CD14 ligands, that are not accommodated by the pocket itself. Positively charged residues are located in the rim at K71 and R72, and just outside the rim at R80, K87, and R92 (Fig. 3A). Hydrophobic residues at W45, F49, V52, F69, Y82, and L89 encircle the rim, and their side chains overlay the entrance to the pocket. When measured using the program Chimera, the pocket length of human CD14 from W45 to L89 is 15.7 Å wide. Interestingly, the hydrophobic pocket entrance is subdivided by an interaction between the α1 residue F49 and the α3 residue Y82 (Fig. 3B). Comparison of mouse and human CD14 pocket rim residues. (A) The structure of the rim of the predicted N-terminal ligand-binding pocket of both mouse and human CD14 are overlaid. Rim residues of human CD14 are denoted in red, and those of mouse CD14 are denoted in blue. Regions important for LPS binding, as determined from previous mutagenesis, blocking Ab, and epitope mapping studies, are indicated in black with gray text. (B) Space-filling representations of the residues located on the rim of the predicted N-terminal ligand-binding pocket of human and mouse CD14 are displayed in red and blue, respectively. Regions important for LPS binding are displayed in black ribbon. Human soluble CD14 purifies and crystallizes as a monomer (Supplemental Fig. 1A, 1B). In contrast, the murine protein crystalized as a dimer with the dimer interface composed of C-terminal β-strand interactions (52). The mouse and human CD14 structures are comparable at the C terminus because both were truncated at similar positions to make them more amenable to crystallization (52). Different crystallization conditions, constructs, and cellular expression systems may account for the differences observed in crystal packing between the two proteins. Nevertheless, it is unlikely that the C-terminal dimerization of truncated mouse CD14 is biologically relevant (52), as numerous biophysical studies support the idea that bioactive soluble CD14 is a monomeric protein (4, 12, 13, 17, 22–24). Human and mouse CD14 crystal structures contain a bent solenoid fold and asparagine ladder, which are structural features typical of leucine-rich repeat proteins (70). In fact, both proteins are highly superimposable with a root mean square deviation of 1.089 Å (Fig. 1B). The secondary structure of human CD14 includes α helices and β strands that are equivalent to α1, α4, α5, α6, α7, and β3 to β13 of the published mouse CD14 structure (Fig. 1B, 1C) (52). Although helical coils exist in human CD14 at locations that are synonymous to helices α2 and α3 of mouse CD14, the structure resolution falls just outside the range needed to determine helical packing with certainty (Fig. 1A, 1C) (71, 72). Human and mouse CD14 both contain a large N-terminal hydrophobic pocket consistent with their similar roles in the binding and delivery of various lipidated molecules including LPS (Fig. 2A, 2B). 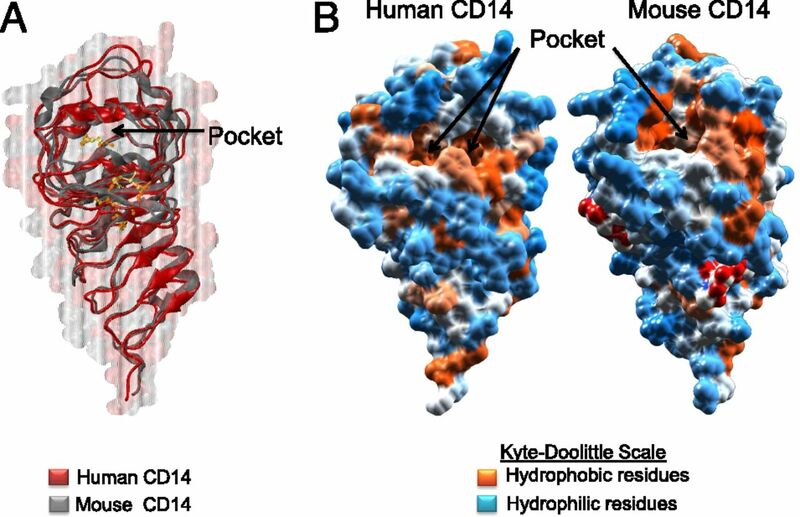 Similar to human CD14, the main pocket and subpockets present in mouse CD14 are composed of hydrophobic residues within α1-5, β1-6, and their connecting loops (52). Using a structure-based sequence alignment, created using MultiSeq in Visual Molecular Dynamics, we compared the general amino acid characteristics present in the residues at the rim of the proposed binding pocket in both structures (73). The authors of the mouse CD14 crystal structure identified hydrophilic and hydrophobic amino acids in rim residue positions indicated in blue (52) (Fig. 3A). Many of these residues, including P39, W41, F45, and Q77, are conserved with rim residues at the pocket entrance of human CD14. Thus, the N-terminal hydrophobic pocket found in our crystal structure revealed a conservation of pocket size and hydrophobicity with that of mouse CD14. Despite the wide-ranging structural similarities between mouse and human CD14, differences do exist. For example, although the amino acids found at equivalent positions of mouse and human CD14 generally have similar physical properties, there is variation in the charge of certain rim residues. Namely, the positively charged K38 residue present in the mouse protein is not retained in the human protein. Likewise, the negatively charged D44 residue in human CD14 is not found in mouse CD14. Finally, the diameter and subdivision of the entrance to the pocket differs between species. The mouse crystal structure reveals an 8.0-Å wide entrance to the pocket that is bounded on one side by a hydrophobic interaction between F45 and F78 (52) (Fig. 3A, right side). Residues F45, L49, and I81 in the mouse CD14 structure create additional hydrophobic interactions that shield this side of the pocket. These hydrophobic interactions of the mouse CD14 pocket are not present in the human CD14 structure whose pocket extends to include the rim residues T85 and L89 (Fig. 3A). The biological significance of these differences between the pocket and associated rim of mouse and human CD14 is difficult to define without structural information from ligand-bound proteins. CD14 sensitizes cells to LPS by delivering this bioactive lipid to MD-2, an essential component of the TLR4 signaling complex. All members of the MD-2–related lipid-recognition protein superfamily are characterized by two β sheets organized in an αβ cup fold to create a centralized hydrophobic LPS-binding cavity (74). In the crystal structures of human and mouse MD-2 bound to lipid IVa, all four acyl chains of the ligand are buried inside and occupy the majority of the hydrophobic pocket volume (75, 76). Crystal structures of MD-2 in the context of the entire mouse and human TLR4/MD-2/LPS homodimeric signaling complex reveals a narrow and deep (1720 Å3 volume) hydrophobic binding pocket that completely sequesters five of the six fatty acid chains (77, 78). The remaining unbound acyl chain lies along the surface of MD-2 and, together with the F126 loop of MD-2, creates a new hydrophobic patch that promotes homodimer formation by association with TLR4 from an adjacent TLR4/MD-2/LPS complex (19, 77). Compared with MD-2, CD14 has been reported to afford less protection against enzymatic removal of secondary fatty acids of bound LPS (79). This probably reflects the fact that at ∼820 Å3, the hydrophobic pockets of both human and mouse CD14 are considerably smaller than that of MD-2 (52) (Fig. 2A, 2B). Similar to MD-2, previous circular dichroism, tryptophan fluorescence, and nuclear magnetic resonance studies suggest that LPS binding does not induce large structural changes in human CD14 (50, 80). Given these volume constraints and pocket rigidity, it is unlikely that CD14 can accommodate all the acyl chains of LPS. This may contribute to the reduced affinity of CD14 for LPS compared with MD-2 (22, 23). Given the physical limitations of the hydrophobic pocket, we hypothesize that CD14 stabilizes additional fatty acid chains on a hydrophobic cluster located near α1 just outside of the pocket entrance. A similar hydrophobic cluster is present in a comparable location in the crystal structure of mouse CD14 (52) (Fig. 2B). In human CD14, the hydrophobic cluster is composed of the aa F32, F49, V52, S53, A54, V55, and L89 (Fig. 2B). This cluster and associated acyl chains of LPS could perhaps create a new protein–protein interaction surface that may help facilitate the transfer of LPS to another molecule such as MD-2. Our crystal structure confirms that the hydrophobic pocket encompasses the N-terminal half (aa 20–171) of CD14 that has been shown to be the bioactive portion of the protein (28). Extensive deletion mutagenesis, alanine scanning mutagenesis, and epitope mapping of inhibitory anti-CD14 Abs have revealed four separate regions in the N-terminal half of CD14 that are critical for LPS binding and cell activation (Fig. 3B). These four functionally important regions are delineated by aa 26–32, 41–44, 56–64, and 78–83, which are physically located near β1, within the loop preceding α1, across β3, and within α3, respectively (28, 81–84). In addition, LPS binding has been shown to protect aa 57–64 from endoprotease AspN digestion (80). The residues in the first three regions near α1, β1, and β3 appear to fulfill critical roles in forming the pocket entrance, capping the leucine-rich repeat β sheet and/or stabilizing proper folding of the solenoid. Residues in the fourth region encompass a Y82 loop located on the opposite side of the pocket entrance. Although Y82 appears to weakly block the entrance of the pocket through interaction with F49, we believe that upon binding LPS, these hydrophobic residues may change position to accommodate the acyl chains within the pocket. Although the corresponding interaction is represented by F45 and F78 in mouse CD14, additional hydrophobic residues present in mouse CD14, but absent in human CD14, close off the pocket entrance (Fig. 3A, 3B). Overall, our human CD14 crystal structure allows for the resolution of an N-terminal hydrophobic pocket predicted by multiple studies to be the LPS-binding site. Compared with mouse CD14, our work provides an alternative definition of rim residues, reveals an expanded pocket entrance, and identifies a unique hydrophobic bridge feature that incorporates residues shown to be important in LPS binding and cell activation (Fig. 3A, 3B). Hydrophilic residues at the opening of MD-2 have been shown to be important for LPS binding by properly aligning the negatively charged 1 and 4′ phosphates of LPS (42, 77). Similar to MD-2, charged rim residues in CD14 may be important for orienting or binding LPS. For example, previous work has shown that mutation of E47, which falls near the front of the rim in α1, to either lysine or arginine can block binding of P. gingivalis LPS (85). Solution NMR spectroscopy analyzing soluble CD14 aa 20–171 bound to the Re chemotype of LPS did not have structural assignments available upon publication but does show high average temperature factor evidence for hydrophilic residues at the rim, suggesting local flexibility to accommodate LPS binding (50). Further work to develop a ligand-bound CD14 structure would help to clarify the roles of both the hydrophobic binding pocket and the hydrophilic rim residues required for ligand binding. A number of natural and synthetic acylated agonists and antagonists are known to be shuttled by CD14. For example, CD14 delivers triacylated and diacylated agonists to complexes formed by members of the TLR2 subfamily (33–40, 86). Natural antagonists of LPS, including Rhodobacter sphaeroides pentacylated lipid A, tetraacylated lipid IVa, and monophosphoryl lipid A, an approved vaccine adjuvant in Europe, are shuttled by CD14 to MD-2/TLR4 (78, 87–90). Eritoran, a synthetic LPS antagonist, that is structurally similar to lipid IVa, is also delivered to MD-2 by CD14 (91, 92). More recently, synthetic LPS inhibitors derived from either diacylated sugars or tetraacylated sulfate–containing compounds have been identified and shown to competitively block LPS binding to CD14 (93–95). It is highly likely that the hydrophobic binding pocket in human CD14 accommodates these natural and synthetic agonists and antagonists especially as they contain fewer acyl chains than hexaacylated enteric bacterial LPS (89, 96). Because TLR4 inhibitors are largely LPS mimics that are either delivered by CD14 or directly compete with LPS for interaction with CD14, the structural information presented in this article may further the design of drugs for the treatment of sepsis and other inflammatory diseases. We thank Danielle Gray and Yi Gui Gao at the George L. Clark X-Ray Facility at the University of Illinois Urbana-Champaign; Raven Huang, Chio Mui Chan, and Diana Rañoa at the University of Illinois Urbana-Champaign; and Amy Sarjeant at the Northwestern Integrated Molecular Structure Education and Research Center for technical advice. We thank Theresa Gioannini and Jerrold Weiss at the University of Iowa for purified LBP; David Kranz at the University of Illinois Urbana-Champaign for the modified pDisplay vector; and Keith Brister, Joseph Brunzelle, David Smith, and Zdzislaw Wawrzak at the Life Sciences Collaborative Access Team (21 ID–F/G at Argonne National Laboratory, Advanced Photon Source) for technical assistance during crystallographic data collection. This work was supported by National Institutes of Health Grants R01 AI052344 (to R.I.T.) and T32 GM007283 (to S.L.K.). The protein structure coordinates presented in this article were submitted to the Protein Data Bank (http://www.rcsb.org/pdb/search/structidSearch.do?structureId=4GLP) under accession number 4GLP. Bazil, V., V. Horejsi, I. Hilgert, and M. J. McMichael, eds. 1982. Leucocyte typing III. White cell differentiation antigens. In The Workshop: Myeloid Panel Antibodies Recognizing the 53-kDa Molecular Weight Monocyte Antigen (CD14). Oxford University Press, Oxford, UK, p. 611–613.
. 1988. The monocyte differentiation antigen, CD14, is anchored to the cell membrane by a phosphatidylinositol linkage. J. Immunol. 141: 547–552.
. 1989. Monocyte antigen CD14 is a phospholipid anchored membrane protein. Blood 73: 284–289.
. 1990. CD14, a receptor for complexes of lipopolysaccharide (LPS) and LPS binding protein. Science 249: 1431–1433.
. 2000. Soluble CD14-mediated cellular responses to lipopolysaccharide. Chem. Immunol. 74: 108–121.
. 2012. Bacterial sensing, cell signaling, and modulation of the immune response during sepsis. Shock 38: 227–242.
. 1999. Clinical gram-positive sepsis: does it fundamentally differ from gram-negative bacterial sepsis? Crit. Care Med. 27: 1608–1616.
. 1996. Resistance to endotoxin shock and reduced dissemination of gram-negative bacteria in CD14-deficient mice. Immunity 4: 407–414.
. 1985. Newer aspects of the chemical structure and biological activity of bacterial endotoxins. Prog. Clin. Biol. Res. 189: 31–51.
. 2002. Lipopolysaccharide endotoxins. Annu. Rev. Biochem. 71: 635–700. Erridge, C., E. Bennett-Guerrero, and I. R. Poxton. 2002. Structure and function of lipopolysaccharides. Microbes Infect. 4: 837–851.
. 1994. Lipopolysaccharide (LPS)-binding protein accelerates the binding of LPS to CD14. J. Exp. Med. 179: 269–277.
. 1995. Lipopolysaccharide binding protein-mediated complexation of lipopolysaccharide with soluble CD14. J. Biol. Chem. 270: 10482–10488.
. 1986. Isolation of a lipopolysaccharide-binding acute phase reactant from rabbit serum. J. Exp. Med. 164: 777–793.
. 1990. Structure and function of lipopolysaccharide binding protein. Science 249: 1429–1431.
. 1996. Catalytic properties of lipopolysaccharide (LPS) binding protein. Transfer of LPS to soluble CD14. J. Biol. Chem. 271: 4100–4105.
. 1988. The CD14 monocyte differentiation antigen maps to a region encoding growth factors and receptors. Science 239: 497–500.
. 1994. CD14 is a pattern recognition receptor. Immunity 1: 509–516.
. 1999. MD-2, a molecule that confers lipopolysaccharide responsiveness on Toll-like receptor 4. J. Exp. Med. 189: 1777–1782.
. 2007. A dimer of the Toll-like receptor 4 cytoplasmic domain provides a specific scaffold for the recruitment of signalling adaptor proteins. PLoS ONE 2: e788.
. 2004. Isolation of an endotoxin-MD-2 complex that produces Toll-like receptor 4-dependent cell activation at picomolar concentrations. Proc. Natl. Acad. Sci. USA 101: 4186–4191.
. 2007. Specific high affinity interactions of monomeric endotoxin.protein complexes with Toll-like receptor 4 ectodomain. J. Biol. Chem. 282: 1010–1017.
. 2007. Transfer of monomeric endotoxin from MD-2 to CD14: characterization and functional consequences. J. Biol. Chem. 282: 36250–36256.
. 2008. Isolation of monomeric and dimeric secreted MD-2. Endotoxin.sCD14 and Toll-like receptor 4 ectodomain selectively react with the monomeric form of secreted MD-2. J. Biol. Chem. 283: 21881–21889.
. 1995. Both membrane-bound and soluble forms of CD14 bind to gram-negative bacteria. Eur. J. Immunol. 25: 1436–1441.
. 1996. Monocytes can phagocytose Gram-negative bacteria by a CD14-dependent mechanism. J. Immunol. 157: 4119–4125.
. 1999. Structures in Bacillus subtilis are recognized by CD14 in a lipopolysaccharide binding protein-dependent reaction. Infect. Immun. 67: 2964–2968. Stelter, F., M. Bernheiden, R. Menzel, R. S. Jack, S. Witt, X. Fan, M. Pfister, and C. Schütt. 1997. Mutation of amino acids 39-44 of human CD14 abrogates binding of lipopolysaccharide and Escherichia coli. Eur. J. Biochem. 243: 100–109.
. 1997. Phagocytosis of gram-negative bacteria by a unique CD14-dependent mechanism. J. Leukoc. Biol. 62: 786–794.
. 1997. Lipopolysaccharide-binding protein and soluble CD14 transfer lipopolysaccharide to phospholipid bilayers: preferential interaction with particular classes of lipid. J. Immunol. 158: 3925–3934.
. 1997. Lipopolysaccharide binding protein and soluble CD14 catalyze exchange of phospholipids. J. Clin. Invest. 99: 315–324.
. 1998. Phosphatidylinositides bind to plasma membrane CD14 and can prevent monocyte activation by bacterial lipopolysaccharide. J. Biol. Chem. 273: 24309–24313.
. 2006. CD14 directly binds to triacylated lipopeptides and facilitates recognition of the lipopeptides by the receptor complex of Toll-like receptors 2 and 1 without binding to the complex. Cell. Microbiol. 8: 1899–1909.
. 1998. Binding of bacterial peptidoglycan to CD14. J. Biol. Chem. 273: 8680–8690.
. 1996. CD14 is a cell-activating receptor for bacterial peptidoglycan. J. Biol. Chem. 271: 23310–23316.
. 1996. Mycobacterial lipoarabinomannan recognition requires a receptor that shares components of the endotoxin signaling system. J. Immunol. 157: 2549–2554.
. 1998. Soluble CD14(1-152) confers responsiveness to both lipoarabinomannan and lipopolysaccharide in a novel HL-60 cell bioassay. J. Immunol. 161: 4244–4251.
. 2007. Identification by surface plasmon resonance of the mycobacterial lipomannan and lipoarabinomannan domains involved in binding to CD14 and LPS-binding protein. FEBS Lett. 581: 1383–1390.
. 1999. Toll-like receptor 2 functions as a pattern recognition receptor for diverse bacterial products. J. Biol. Chem. 274: 33419–33425.
. 1993. Lipopolysaccharide activation of human endothelial and epithelial cells is mediated by lipopolysaccharide-binding protein and soluble CD14. Proc. Natl. Acad. Sci. USA 90: 2744–2748.
. 1997. Cellular binding of soluble CD14 requires lipopolysaccharide (LPS) and LPS-binding protein. J. Biol. Chem. 272: 23157–23164.
. 1994. Recombinant soluble CD14 inhibits LPS-induced tumor necrosis factor-alpha production by cells in whole blood. J. Immunol. 152: 5868–5876. Stelter, F., M. Pfister, M. Bernheiden, R. S. Jack, P. Bufler, H. Engelmann, and C. Schütt. 1996. The myeloid differentiation antigen CD14 is N- and O-glycosylated. Contribution of N-linked glycosylation to different soluble CD14 isoforms. Eur. J. Biochem. 236: 457–464.
. 1999. Expression and refolding of functional fragments of the human lipopolysaccharide receptor CD14 in Escherichia coli and Pichia pastoris. Protein Expr. Purif. 17: 96–104.
. 2001. [Clone and expression of human soluble CD14 and study of its function]. Sheng Wu Gong Cheng Xue Bao. 17: 269–272.
. 2003. Purification and characterization of human soluble CD14 expressed in Pichia pastoris. Protein Expr. Purif. 28: 310–320.
. 2007. Purification of soluble CD14 fusion proteins and use in an electrochemiluminescent assay for lipopolysaccharide binding. Protein Expr. Purif. 51: 96–101.
. 2008. The differential impact of disulfide bonds and N-linked glycosylation on the stability and function of CD14. J. Biol. Chem. 283: 3376–3384.
. 2008. Solution NMR studies provide structural basis for endotoxin pattern recognition by the innate immune receptor CD14. Biochem. Biophys. Res. Commun. 368: 231–237.
. 2012. Fusion of the Fc part of human IgG1 to CD14 enhances its binding to gram-negative bacteria and mediates phagocytosis by Fc receptors of neutrophils. Immunol. Lett. 146: 31–39.
. 2005. Crystal structure of CD14 and its implications for lipopolysaccharide signaling. J. Biol. Chem. 280: 11347–11351. 2005. Sepsis: still going strong. Arch. Med. Res. 36: 672–681.
. 2010. Human TLRs 10 and 1 share common mechanisms of innate immune sensing but not signaling. J. Immunol. 184: 5094–5103.
. 2004. Optimum solubility (OS) screening: an efficient method to optimize buffer conditions for homogeneity and crystallization of proteins. Acta Crystallogr. D Biol. Crystallogr. 60: 1670–1673. McPherson, A. 1990. Current approaches to macromolecular crystallization. Eur. J. Biochem. 189: 1–23.
. 1991. Sparse matrix sampling: a screening method for crystallization of proteins. J. Appl. Crystallogr. 24: 409–411. 1985. Use of polyethylene glycol in the crystallization of macromolecules. Methods Enzymol. 114: 120–125.
. 1999. Effects of additives for the crystallization of proteins and nucleic acids. J. Cryst. Growth 196: 365–376.
. 1986. The effects of netural detergents on the crystallization of soluble proteins. J. Cryst. Growth 76: 547–553. 2003. ‘Cool’ crystals: macromolecular cryocrystallography and radiation damage. Curr. Opin. Struct. Biol. 13: 545–551.
. 2005. Post-crystallization treatments for improving diffraction quality of protein crystals. Acta Crystallogr. D Biol. Crystallogr. 61: 1173–1180. Walter, T. S., C. Meier, R. Assenberg, K. F. Au, J. Ren, A. Verma, J. E. Nettleship, R. J. Owens, D. I. Stuart, and J. M. Grimes. 2006. Lysine methylation as a routine rescue strategy for protein crystallization. Structure 14: 1617–1622.
. 1998. Low endotoxic potential of Legionella pneumophila lipopolysaccharide due to failure of interaction with the monocyte lipopolysaccharide receptor CD14. Infect. Immun. 66: 4151–4157.
. 1995. Soluble CD14 truncated at amino acid 152 binds lipopolysaccharide (LPS) and enables cellular response to LPS. J. Biol. Chem. 270: 1382–1387.
. 1996. The N-terminal half of membrane CD14 is a functional cellular lipopolysaccharide receptor. Infect. Immun. 64: 653–656.
. 1989. Endoglycosidases from Flavobacterium meningosepticum application to biological problems. Methods Enzymol. 179: 505–518.
. 1986. Biochemistry and expression of myelomonocytic antigens. J. Immunol. 137: 3909–3914.
. 1988. Nucleotide sequence of the gene encoding the monocyte differentiation antigen, CD14. Nucleic Acids Res. 16: 4173.
. 2004. Structural principles of leucine-rich repeat (LRR) proteins. Proteins 54: 394–403. 1987. Protein structure. Stability of alpha-helices. Nature 326: 547–548.
. 1988. Helix geometry in proteins. J. Mol. Biol. 201: 601–619.
. 2006. MultiSeq: unifying sequence and structure data for evolutionary analysis. BMC Bioinformatics 7: 382.
. 2002. ML—a conserved domain involved in innate immunity and lipid metabolism. Trends Biochem. Sci. 27: 219–221.
. 2007. Crystal structures of human MD-2 and its complex with antiendotoxic lipid IVa. Science 316: 1632–1634.
. 2012. Structural basis of species-specific endotoxin sensing by innate immune receptor TLR4/MD-2. Proc. Natl. Acad. Sci. USA 109: 7421–7426.
. 2009. The structural basis of lipopolysaccharide recognition by the TLR4-MD-2 complex. Nature 458: 1191–1195.
. 2001. Human MD-2 confers on mouse Toll-like receptor 4 species-specific lipopolysaccharide recognition. Int. Immunol. 13: 1595–1599.
. 2007. Endotoxin-binding proteins modulate the susceptibility of bacterial endotoxin to deacylation by acyloxyacyl hydrolase. J. Biol. Chem. 282: 7877–7884.
. 1995. CD14: physical properties and identification of an exposed site that is protected by lipopolysaccharide. J. Biol. Chem. 270: 5213–5218.
. 1995. Identification of a domain in soluble CD14 essential for lipopolysaccharide (LPS) signaling but not LPS binding. J. Biol. Chem. 270: 17237–17242.
. 1995. A region of human CD14 required for lipopolysaccharide binding. J. Biol. Chem. 270: 361–368.
. 2000. Structure-function analysis of CD14 as a soluble receptor for lipopolysaccharide. J. Biol. Chem. 275: 3144–3149.
. 1995. Identification of a lipopolysaccharide binding domain in CD14 between amino acids 57 and 64. J. Biol. Chem. 270: 5219–5224.
. 1997. Identification of CD14 residues involved in specific lipopolysaccharide recognition. Infect. Immun. 65: 293–297.
. 2001. Discrimination of bacterial lipoproteins by Toll-like receptor 6. Int. Immunol. 13: 933–940.
. 1991. Lipid A-like molecules that antagonize the effects of endotoxins on human monocytes. J. Biol. Chem. 266: 19490–19498.
. 2006. Structural regions of MD-2 that determine the agonist-antagonist activity of lipid IVa. J. Biol. Chem. 281: 5484–5491. Rietschel, E. T., T. Kirikae, F. U. Schade, U. Mamat, G. Schmidt, H. Loppnow, A. J. Ulmer, U. Zähringer, U. Seydel, F. Di Padova, et al. 1994. Bacterial endotoxin: molecular relationships of structure to activity and function. FASEB J. 8: 217–225.
. 2007. The vaccine adjuvant monophosphoryl lipid A as a TRIF-biased agonist of TLR4. Science 316: 1628–1632.
. 2007. Crystal structure of the TLR4-MD-2 complex with bound endotoxin antagonist Eritoran. Cell 130: 906–917.
. 2004. Inhibition of endotoxin response by synthetic TLR4 antagonists. Curr. Top. Med. Chem. 4: 1147–1171.
. 2009. Glycolipids and benzylammonium lipids as novel antisepsis agents: synthesis and biological characterization. J. Med. Chem. 52: 1209–1213.
. 2009. Evidence of a specific interaction between new synthetic antisepsis agents and CD14. Biochemistry 48: 12337–12344.
. 2012. A synthetic lipid A mimetic modulates human TLR4 activity. ChemMedChem 7: 213–217. Schromm, A. B., K. Brandenburg, H. Loppnow, A. P. Moran, M. H. Koch, E. T. Rietschel, and U. Seydel. 2000. Biological activities of lipopolysaccharides are determined by the shape of their lipid A portion. Eur. J. Biochem. 267: 2008–2013.